The CrossFit Open is a worldwide CrossFit competition. We do it every year. It’s fun. Last year, over 24 No Drama family members tried their hand at CrossFit “competition.” With so many new faces, we hope to be over 30 this year! Our goal at No Drama: to be HARD TO KILL. Competition helps athletes reach the next level: the pressure to perform pushes you to train harder; the social boost of dozens of your best friends cheering for you will help you reach a higher plane. Heck, watching your teammates GO is inspiring. The three Intramural teams don’t have names yet. But their Captains will be chosen this week. Yep, we chose the FUN bunch to Captain, not our traditional top scorers. We want you to sign up this year; are you really going to say no to Ashleigh, Molly, or Wendy? I don’t think so. Registration for the Open can be done at games.crossfit.com, and choose ‘No Drama CrossFit’ as your Affiliate. Youth athletes born after 02/27/2004 can participate in the intramural open. Athletes under 18 years of age must be accompanied by a parent. Athletes who do not hold a group CrossFit membership at No Drama Fitness may purchase an “Intramural pass” for $100 that gives access to one test per week and all intramural events. RX athletes will be ‘drafted’ onto an Intramural team. We want to ensure even distribution of our most competitive athletes. Following that draft, every other athlete will be recruited. That’s where you come in. You’ll be courted by one of our Team Captains to join their team – probably more than one. Pick the funnest team! +1 Point – Attendance: every member of a team that completes an Open workout at No Drama each week earns one point. Maximum one point per athlete per workout. This goes for Rx AND Scaled competitors! 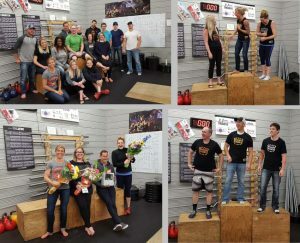 +3 Points – Top 3: every male AND female member who places among the Top 3 at No Drama for each workout (Rx and scaled) gets extra points for their team. +3 Points – Top rookies and best SPIRIT gets extra points for their team. +5 Points (team) – “Spirit of the Open” award. The team with the most noise, pride, and PRESENCE each week will receive 5 bonus points. +5 Points (bonus) – 6th workout: to be announced. This year we will be doing “Friday Night Lights”, with the focus on the party vibe! Coach Andy (and other unfortunates) will demo the workout during the announcement Thursday night. Our goal Friday evening is to get as many people in the building at once as possible. Clear out your Friday nights! To ensure best performance and safety RX competitors go first at 5:30pm right after the warmup and briefing, followed by everyone else. We try to have 1-2 members of each Intramural team represented in each heat. Saturday will be considered the spillover session starting at 10am. The Open will have five workouts; we have a BONUS tournament planned, which will take place the Friday night after. Non-members can attend test sessions for $20, members can use their existing plans to attend. Retry / last chance for workouts will be Sunday; admission to this session is $20 and must be pre-arranged. Any other times can be booked with a coach as a Private Training session, as permitted by availability. We’ll have some random draws each week for prizes, including gear, supplements, and training packages. The top team will also earn a GRAND prize. Details released soon! Our focus is on FUN. We want participation because it will make you fitter, and it will get you high-fives and you’ll be happy and love life more and glow and stuff. If you are unsure if what skills you should be working on for the Open or want to try last years workouts be sure to sign up for the open prep sessions or book a private skill session with one of our coaches. Remember, your coaches and teammates are here to HELP, we will get you through these workouts regardless of ability!